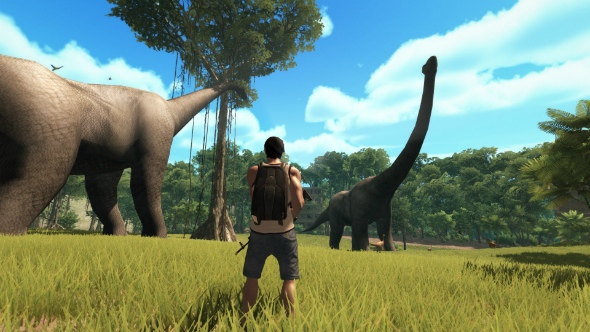 Win a copy of new dinosaur survival game Dinosis Survival on Steam! Since Jurassic Park came out in 1993 we’ve wanted to jump into a world where dinosaurs roam free once again. Well, we say that, but it would probably be terrifying to actually experience that version of reality. Still, videogames have let us wander such a world from the safety of our living rooms, and one of the latest to do that is Dinosis Survival. This is a single-player, third-person survival shooter in which you play Tom Burt, an unfortunate fella who awakens in a jungle packed with dinosaurs. Luckily, he has some guns and ammo to hand, so all he needs to do is hunt for his meals and avoid the nasty bite of a few raptors. But there’s more to Dinosis Survival than running away from a T-Rex and being awed by herding diplodocus. There’s a story that you’ll have to uncover as you explore the jungles, trying to find answers: What happened to this world? Are there any other humans left alive? Where did the dinosaurs come from? If you’re intrigued, we’re giving away 15 Steam keys for Dinosis Survival. All you have to do toenter the giveaway competition is check out the widget below. Every action you complete is worth one entry into the giveaway, and the more actions you complete the more chance you’ll have of winning. We’ll also need your email address so we can send you a code upon winning – we won’t send you spam, promise!